Cool… only if those cosmetic items come to the PC version too ! There’s nothing to indicate that they won’t. Locking them to a specific version of the game, especially one that doesn’t actually do any local rendering, only cloud streaming, would be more work than just releasing them as tickets. I’m guessing once you have them you’ll be able to use them anywhere, but obtaining them in the first place will probably be through some sort of Switch specific mechanism like an exclusive NPC similar to how Toro and Kuro only appear when you play the game on PS4 or Vita. 🙁 no Breath of the Wild Thicc Zelda? Id like it if there was a Nintendo collab in the future. Costumes For Ocarina Zelda , Twilight Zelda, Breath Zelda, maybe Toon Zelda XD or maybe a Sheik repca? For the studs we could get a Gannondorf or Dark Link and Ocarina child Link? Weapon camos for a Light arrow and bow, Hookshot Wire Lance, and a Mag that looks like Navi?, Or… Tingle… maybe? This version of the game uses the same servers as the PC and PS4 version, right? Just using exclusive blocks? It’ll be interesting to know that Link might be running around on people’s PS4s. but will it be free for switch users? The Vita isn’t really region locked. you can choose whichever region you’d like when factory Reseting your Vita. But the Switch isn’t region locked either, you just have to create a new User and assign it to a different region shop. that being said this Cloud version is almost guaranteed to lag horribly, I don’t expect it to be playable. Switch is region free and you can have multiple Nintendo accounts on the system as far as I recall, so people can download games from the Japanese store. Yes, the game is currently available for download from the Japanese eShop. I can finally play as Zelda. 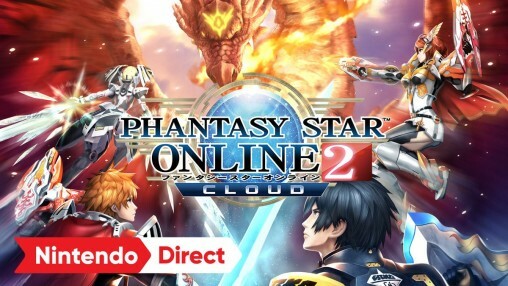 SEGA’s online game on Nintendo’s online services, what could possibility go wrong? Except this has literally nothing to do with nintendos online service but y’know never mind. 4.4? So that’s the reason for removal of ep1-3? I wonder how it was implemented on swish side that they needed that.